Leading off with the title track, Devil’s Dance begins with Babe’s solo piano intro, and then the band enters and slams into the main chord riff, C7 to C half flat 7. These two Harmonic 7th chords are just a Septimal 7th apart. This CD is based on a C of 528 Hertz, and in the ancient Solfeggio system, the pitch 741 Hertz is opposed to C, and in disharmony with it, earning it the name ‘Devil’s Tone’. The guitar solo features a Harmonic Cloud which adds the 11th Harmonic, which is close to the Devil’s Tone but is actually a consonance. In this way, the power and dissonance of that 741 Hertz tone has been reduced and replaced with the 11th Harmonic, a new consonance. The addition of the 147th Harmonic in the Cloud further reduces 741 by reversing it. Dazed And Confused is a reimagining of a song originally written by Jake Holmes and redone by Led Zeppelin. Our version was inspired by both, the main riff being changed to a superchromatic riff, and most of the other riffs have been altered. We added a Harmonic Cloud near the end. Animals is performed on the 24-Fret Just Intonation guitar, and features some inventive playing from Skip and from Timo on fretless bass. Evil was written by Willie Dixon and recorded by Howling’ Wolf. Our version is in the key of C half minor. The Way You Do is a blues that replaces the familiar blues half-step slide down with a quartertone. It is performed on the 24-Fret JI guitar and fretless bass, and features solos by both JC and Timo, and a smooth vocal by Babe. Radio starts out with some uptempo picking before reaching the boogie, which finds JC and Babe trading licks on guitar and piano, with Timo and Skip also getting some trades in. Blackbird is an origin blues, and begins with a Harmonic Cloud in C Ultra Minor. This tonality features the 147th Harmonic as the ultra minor third, yielding the flattest and deepest minor third possible. If it were any lower, it would cease to sound like a minor third, and would sound more like a large 9th. At a point, Skip brings in the cymbals signaling the addition of Harmonics 63 and 189 to the existing 147 ultra minor tonality. 147 is also the half minor third (7/6) of 63, so it exists in 2 dimensions at once. Subsequently, this chord is known as a ‘Transdimensional’ chord, and we also refer to it as the ‘Blackbird’ chord. Lost At Sea closes out the CD, and features the ‘Blackbird’ chord alternating with a pure Harmonic 7th chord built on the 21st Harmonic. This song was also recorded by Fretless Brothers on the CD Live At ShapeShifters. Filled out by Babe’s Harmonic organ, it brings ‘Devil’s Dance to a fitting close. 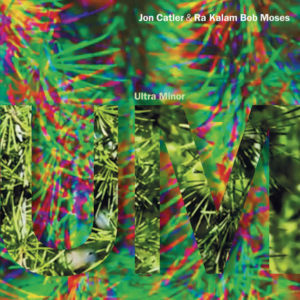 FreeNote CD Track Talk for Jon Catler and Ra Kalam Bob Moses Ultra Minor. The title track, Ultra Minor, refers to the flattest minor third possible, which is the 147th Harmonic. Anything below this in pitch sounds more like a 9th than a minor third, but hearing 147, it definitely has a ‘minor’ type sound, albeit a very deep and unusual minor. I learned this interval from La Monte Young, who uses it in ‘The Well Tuned Piano’ in a couple of places to produce an Ultra Minor sound, but the interval has rarely, if ever, been heard in music apart from that. The first 10 minutes of the piece Ultra Minor are in this key. The entire CD is based on a C of 528 Hertz, and in the ancient Solfeggio system, 741 Hertz is the ‘Devil’s Tone’, in disharmony with the C. Since 741 is contrary and opposing by nature, it makes sense to reverse it, which is 147. I have found this to be a very active and unusual pitch, with a unique mood to it. After about 10 and a half minutes, the Ultra Minor tonality is expanded to include vibratios 63 and 189, which are C half flat and G half flat. 147 is the septimal minor third (7/6) of 63, and still the Ultra Minor third of C, so we call the resulting chord a Transdimensional chord. The piece starts with 1 played in Harmonic Rhythm, so it is a C hit once per each (long) bar. The octave is added, leading into a complete Harmonic Rhythm section where each Harmonic occupies it’s own space in time. The 7th Harmonic is played 7 times per bar, the 9th Harmonic is played 9 times per bar, etc, producing a cascade of rhythm, which is then joined by Fretless Sustainer guitar. Harmonic Rhythm is even less known than the Harmonic Series, but it is an aural example of how the intervals are actually beating. Ra Kalam pivots to the toms, and the piece ends with some Harmonic traveling where the guitar is modulating upward in very small pitch increments. The last few guitar notes echo the Opening Chord of The Well Tuned Piano. Kookaburra is of course named after the Australian laughing bird, and inspired by Ra Kalam and I laughing. Thirteen is an excerpt from a larger work, ‘Codes Of Ascension’, and features the 13th Harmonic chord, played by the chordal guitar in 13 beats. Closer To The Sun features some burning playing. Ra Kalam’s name means ‘The inaudible sound of the invisible sun’. Snowmen Of The Sahara need to keep their cool, as Ra Kalam’s crying drums illustrate. (By spacing numbers 1 – 9 equidistant on a circle, and then connecting these doubling sequence numbers, the lines form a figure 8, which is the symbol for Infinity. It also looks very much like a DNA strand). Rodin has found that the doubling sequence then reverses to 1, 5, 7, 8, 4, 2, followed by the missing numbers (spirit) of 396, which are also then reversed to get 396693. After Eleven finds JC creating some loops for the duo to play with. The CD closes with Night Prayer, a meditation. 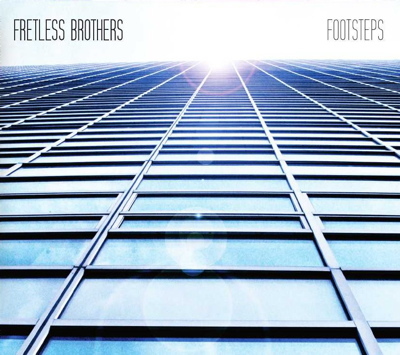 Following is a discussion of the first CD release from Fretless Brothers, titled Footsteps, on FreeNote Records. This recording is performed entirely in the 12-Tone Ultra Plus tuning system, and features Jon Catler and Dane Johnson on 12-Tone Ultra Plus guitars, Hansford Rowe on 12-Tone Ultra Plus bass, and Brian Chase on tuned drums. The compositions are by Jon Catler, and the CD was recorded live at Water Music Studios in Hoboken, NJ. This journey kicks off with the song East Coast Blues. The opening E half minor to B half minor vamp leads to a driving melody in A half minor. These chords use 7/6 for the half minor third, which is flatter and more resonant than a standard minor third. Over a walking bass line, an A Harian chord, which has Harmonics 7 and 21 with a neutral third, connects the A half minor to G quartertone sharp minor, which makes for interesting voice leading. The second song, Grace, features a syncopated counterpoint between the bass and guitar melody. After a metric modulation, Dane takes the first solo over the traveling chord sequence, followed by JC’s solo. Next up is the title track, Footsteps, which further develops the concept of traveling chord changes. Here, the chords move both up and down continually at a fast pace, and the challenge is to improvise melodically over the changes. John Coltrane’s composition Giant Steps was a clear inspiration for this tune, as well as his playing on Interstellar Space. At the bridge, the harmonic movement lands on C half flat Undertone Series minor. Extinction is a solo guitar piece that makes use of some of the extended 13-limit Just Intonation chords possible in the 12-Tone Ultra Plus tuning system. The song is about how when a person dies, that individual becomes extinct. The fifth song, Stillwalker, has three distinct sections. The opening pits an ascending fourths-based line against a descending superchromatic bass counterpoint. The middle section is a heavy B half minor thing, which leads to the arpeggios that inform the third section. Here, another descending superchromatic bass line is combined with some ringing pedal tones, which gives the ‘Stillwalker’ effect of moving while staying in place. The guitar takes the melody over this section, followed by a solo which takes into account both the moving line and the pedal tones. While She Sleeps is a ballad with some unusual harmonic movement which moves to minor chords built on 11th and 13th Harmonics. Jim Mussen plays drums, and JC takes the first solo, followed by Dane and then a bass solo by Hanny. Cat’s Boogie features a high speed chase with the two diverging guitars. JC solos first, then Dane, after which JC and Brian use Harmonic Rhythm to modulate to the ‘Key Of 3’, while Dane and Hanny stay on the boogie. As this song is in A, and the 3rd Harmonic of A is E, the modulation is to E half minor in 3/4 time, against the boogie in A in 4/4. The CD closes on a quieter note with Lament. This piece uses variations on the Ancient Greek tetrachords played in triple canon. The canons continue as the guitar melody sings the lament. 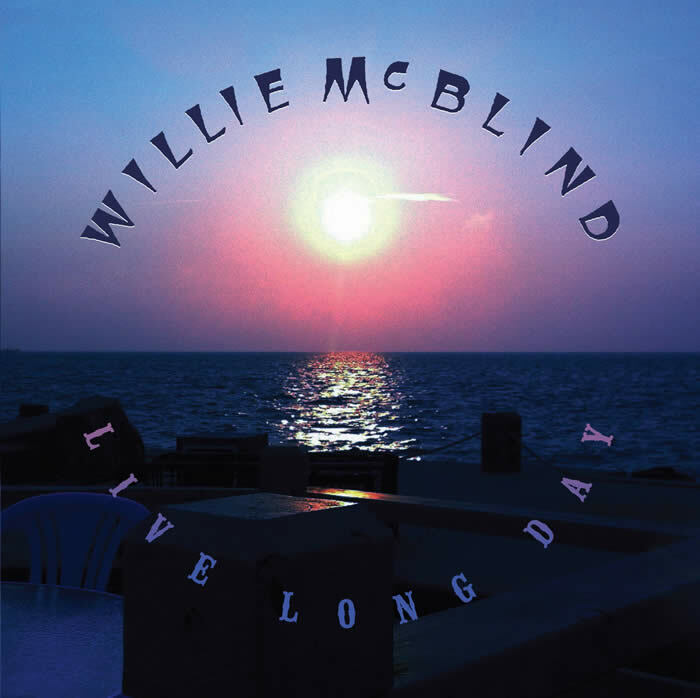 Following is a discussion of the 3rd CD release from Willie McBlind, titled Live Long Day. This recording is performed in 64-tone Just Intonation and 12-Tone Ultra Plus tuning, using fretted and fretless guitars and basses, vocals, autoharp, and tuned drums. Featuring 9 original songs and 1 rearrangement of a Robert Johnson classic, these train-themed tracks were recorded live at Bennett Studios, NJ, a converted train station. This journey starts as all train trips do, with Sittin’ In The Train Station, a jump blues. Guitar and bass kick things off in unison with a pure Harmonic Series figure using Harmonics 8, 10, 11, and 12 based on an E fundamental. The Harmonic 7th is added to end the phrase, spelling out what could be called the true, natural version of the Lydian Flat Seventh scale. The rhythm guitar then adds a Just version of the ‘Hendrix’ chord, E 7#9, using 7/6 for the raised 9th. The lead guitar, although it sounds like a slide, is also played on the 64-tone JI guitar. The IV chord uses a parallel modulation to an A Harmonic Series. The vocal harmonies here include a tritone, but because of the pure tuning it is not heard as a dissonance. The lead guitar fills and solo lean towards a jazz sound, which is not uncommon in jump blues, and feature the 13th Harmonic. Next up is the title track, Live Long Day, which is performed entirely in the Undertone Series, the mirror image of the Overtone Series. While the Overtone Series produces a major triad using it’s first 6 Harmonics, the Undertone Series produces a minor triad using the mirror image of those same Harmonics. It seems the Undertone Series is the true derivation of minor, and it’s darker and unique mood sets the tone for the never ending work that must be done to lay the track that allows the journey to proceed. The third track, Anywhere, deals with maintaining a feeling of hope in the face of isolation. The singer waits, and if the train comes, he or she will take it anywhere it is going. The basic track is played on 12-Tone Ultra Plus guitar and bass, and the lead guitar is fretless. This song uses some symmetrical lyrics for the verses, and in the end the train goes off into anywhere, represented by the use of Harmonic Rhythm, which gives each Harmonic pitch it’s own distinct rhythm. Slow Moving Train begins with a unison superchromatic ‘horn line’. Once everyone has boarded, the train gets going, and then the vocals enter to tell the true story of a man who got crushed by something that we all saw coming, but were powerless to stop. After the damage is done, the horn line reappears in reverse. Then, before the train comes to a complete stop, time is suspended for a moment. In the modern multi-tasking world, sometimes the desire arises for one thing, done right. Like Casey Jones, the legendary engineer who gave his life at the helm. One Thing is played on 64-tone and features a fretless solo. Mighty Long Time is a minor blues performed in the 12-Tone Ultra Plus system. It is about re-experiencing the feeling of youthful exuberance, when putting it all on the line seemed like the natural thing to do. This feeling is echoed in the opening note – as it is bent upward, it causes the open A string to vibrate sympathetically, and the vibrations speed up as the bent note rises. The next track, Down The Road, is a country blues with a traveling theme. The vocal arrangement plays the man against the woman. Love In Vain is a reworking of the Robert Johnson song, with the Robert’s intro recast as A Harmonic 7 to A 11:13 half minor, which here acts like a diminished chord. Babe takes the vocal on this in her own style. Boogie Train is a reinvention of the boogie, featuring Harmonic Rhythm and Harmonic Lyrics. The boogie line is played with Harmonic 7ths, 11ths, and 13ths, then the Harmonic rhythm is introduced, giving each pitch it’s own rhythm. So, the fundamental A is played 4 times per bar as it is the 4th harmonic. The 3rd Harmonic is played 3 times per bar, then double timed on tuned drums to 6 times per bar. The 7th Harmonic is played 7 times per bar, the 9th is played 9 times, etc. Just as each pitch occupies it’s own space, each Harmonic Rhythm occupies it’s own time, resulting in a cascade. This aspect of Just Intonation rhythm is seldom used in music, but is present in science in Harmonics Theory, and found throughout the cosmos. It is Space/Time made audible. The singers trade lines, then after the solo section the vocals enter with Harmonic Lyrics, where each pitch has it’s own specific word and meaning. For instance, the word ‘Man’ is sung on the tonic by the male voice, and the word ‘Woman’ is sung on the tonic by the female voice. ‘Child’ is the 9th Harmonic, 9/8, close to the Man/Woman. ‘Devil’ is the half minor third, 7/6. ‘Ride’ is the 3/2, ‘Lover’ is the 4/3, and ‘Leavin’ is the 11/8. At the end, the Woman rides off on a cascade of Harmonic Rhythm. The CD closes with the song The Train That Never Came, played in 12-Tone Ultra Plus tuning. The would-be passenger is left waiting for the train. What appears at the conclusion is the Ghost Train, with a Train Cloud made up of pure Harmonic Series pitches. Played on the Fretless Sustainer guitar, this sound carries the listener to his final destination. 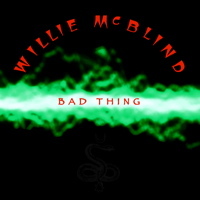 This page features a discussion of the second cd release from Willie McBlind, titled Bad Thing. This is a blues record that is performed in 64-tone Just Intonation tuning, using fretted and fretless guitars, fretless bass, drums, and vocals. There are 6 original compositions and 3 rearrangements of songs from other well known blues artists. All the songs were recorded live in the studio with minimal overdubbing. 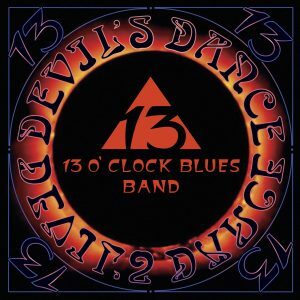 The first song, 13 O’Clock Blues, makes prominent use of the 13th Harmonic in both the bass line and the chordal accompaniment. In the bass line, the 13th is used as a neutral sixth in place of the standard major sixth. This is a parallel blues in that the IV and V chords also use the 13th Harmonic in the bass and chords. The turnaround is a superchromatic play on the standard Robert Johnson turnaround, and the intro uses this turnaround in reverse (retrograde). The second song, Bad Thing, uses fretless guitar throughout. Although it is fretless, we are still playing the specific notes from the 64-tone Just Intonation tuning system. We were able to add a tuned cowbell to the choruses that changes pitch with the chords. Primo is a song about a horse we met named Premo. When we visited him in his stall, he was restless and kicked the wall a number of times, leaving deep hoof marks. We could identify with how it felt to be cooped up. The bass line here kicks against the superchromatic chordal guitar melody, which is a play on a riff known in the old Delta as ‘A Down the Staff’. The fourth song, Blood Moon, uses Mississippi Fred McDowell’s You Got To Move as inspiration. It is performed on fretless guitar in Drop D tuning, and segue’s into the next song, Nobody’s Fault But Mine, also on fretless. This was taken from one of our favorite slide guitarists, Blind Willie Johnson. Song number six, Storms, is a half minor blues that uses the 7/6 as the half minor third. Babe and I lost three of our parents in the past couple of years. This song was written in the middle of that time, after we had lost one and had just gotten the diagnosis of another. It’s true that storms never last, but they can be tough to get through. Stones In My Passway is a version of a Robert Johnson tune. It works very well in JI, and Babe is able to do her own thing while staying true to Roberts’. Song number 8 is titled It Don’t Make Sense (You Can’t Make Peace) and was written by Willie Dixon, who was one of the greatest blues songwriters. Although he made more money on songs covered by Led Zeppelin, Muddy Waters, Howlin’ Wolf, and others, he named this as his favorite song that he had written. The sentiment expressed in the song is just as true today. Our arrangement climaxes with a ‘war’ section. The last song, One Lucky Man, is a ballad featuring a heartfelt guest vocal by Hugh Pool. I wrote this one after I had been fasting for ten days due to a stomach problem, and all I wanted was to live long enough to see my girl’s face again. I was able to do that, so I guess I am one lucky man. This page features a discussion relating to Willie McBlind and their new CD, Find My Way Back Home. This is a blues CD, although other flavors certainly appear – it is the feeling of the music which makes this a blues CD. The two main types of tuning used on this recording are Just Intonation and 12-Tone Ultra Plus. The Just system uses 64 notes per octave and is a 13-limit system, meaning that the 13th Harmonic is the highest prime used as an integral part of the system. In comparison, American composer Harry Partch used an 11-limit system. By extending this to the 13-limit, we gain access to the first complete scale found in Nature, which can be found in the 8-16 Harmonics of the Overtone Series. The history of music can be viewed as the story of Man’s gradual acceptance of higher members of the Overtone Series. From unisons to octaves, then from perfect 5ths to 3rds, 7ths and beyond, the evolution of Man’s ear can be traced. Willie McBlind’s music shows that 13 is a consonance and that Man’s ear has evolved to be able to recognize this fact. Chicken, the first track on Find My Way Back Home, is a good example of the usage of 13. A live recording with guitar, bass and drums, the first 4 verses of this song display the slide guitar sound that is available on the 64-tone JI guitar. The shear number of frets enables the notes to be connected by sliding over the frets in a way similar to fretless guitar or the use of a slide. In the 5th verse, each of the 3 chords of this 12 bar blues are played with the addition of their respective 13th Harmonics (E13, A13, B13). Although most people have never heard this chord before, the response has been that most everyone who hears these chords considers them to be consonant. Have a listen for yourself and please let us know if this is true for you also. The long sustained chord at the end of Chicken is the complete 8-16 Harmonic Series. Canonballer, the second track on Find My Way Back Home, begins with a chordal riff that uses a Just version of the popular #9 chord. The guitar melody is joined by female voice which leads to the use of a classical composition technique known as “canons.” Here guitar and voice follow each other on melodies and variations. Find My Way Back Home, the title song of the record, starts with male and female voices trading verses. The second verse ends with a stacked 11-limit vocal chord. After the guitar solo, the vocal stack returns elongated. This song introduces the full vocal approach of Willie McBlind. First, although the words are drawn from a very old source, the story being told here is true for the singers. The male voice is the sound of a man telling his story. It is not an imitation of another singer’s voice, rather it is the sound that is produced when someone reaches down to sing the real blues about their own life. The female voice, although differing in timbre, is singing in a way that is true to her. The coming together of these 2 voices, “like diamonds and coal”, combine to express a wide arc of human experience. The duality of this approach has a long tradition in blues and can be heard in the recordings of artists like Blind Willie Johnson and Blind Willie McTell (two of the sources of the band’s name.) The stacking of these voices in the vocal cloud sections is an innovation not likely to be found on other blues recordings. Hope My Baby was inspired by the classic “King Biscuit Time” sides of harmonica great Sonny Boy Williamson II, performed in the 12-Tone Ultra Plus tuning system. This song tells the story of a guy on his way to see his girl. He’s thinking, “I hope she don’t want to ‘talk’,” while she is anticipating his arrival thinking, “I hope he’s gonna hear what I have to say.” He’s thinking, “I hope she don’t cry when she founds out I done wrong”, while she’s thinking, “I hope my baby don’t fall.” Finally, he’s left hoping his baby’s gonna call him, while she’s hoping he’ll finally see the light now that she’s moved on. Shallow Gray is a lament, the woman telling her lover that one day soon she will disappear. The song features a “cloud” section that evokes clouds over the Delta. Pony Blues is the only cover song on the record as it was the theme song of the original Delta bluesman Charley Patton. The first section with guitar and voice leads to the entrance of bass and drums and you’d better hold on tight to that pony! Train continues the journey which now finds its riders on a steel horse. The powerful lead vocal, liquid guitar solo and band dynamics push the locomotion to the breaking point. Fall – the fretless guitar intro sets up the feeling of this song while nodding to Blind Willie Johnson. The deeply felt story of betrayal is satisfyingly expressed by the two voices, amplified by the sliding Delta power chords and the descending, slowed-down fall of the ending. Every Time also makes use of canons as a compositional device. The song deals with the influence of the past as it weaves into the present, represented again by intertwining guitar and vocal lines. Time Ain’t Long starts with a “Time Cloud”, which was performed live on 12-Tone Ultra Plus Guitar. In the cloud, time is suspended and the harmonics of the tuning are combined with picking technique to produce difference tones and summation tones which are not actually being fingered, resulting in melodies and aural phenomena beyond that capable in standard tuning. This leads to an epic boogie where the 2 voices are joined by a melodic solo, then an whole chorus joining, ending with a vocal Ascension to the skies that completes the album’s journey from the chicken coop to the pony to the train to the beyond, finding the way back home again to our beginnings. Is there a tuning that is best for the blues? Are there tuning systems that do not work for blues? The early bluesmen, such as Robert Johnson, Son House, and the aforementioned Charley Patton obviously had no access to today’s common electronic tuners. In addition, they generally tuned their guitars to open chords, often using a slide on top of that. This was not strict 12-Tone Equal Tempered music. On occasion, a singer would forego instruments for an a cappella rendition perhaps supported solely by a hand clap, (such as in Son House’s John The Revelator), No matter what tuning was used (or not used), it was the feeling of the blues that mattered. This still holds true today. If someone says a certain tuning system is quote “not right for blues”, they are simply saying that they do not possess the talent to transcend the tuning and get to the feeling. In the Harmonic Series, Harmonics 4:5:6:7 spell out what is called a Harmonic 7th Chord. The blues has often been based on 7th Chords. Although different, the 12-Tone Equal Tempered 7th Chord is based on Nature’s first chord. This is one way that Just Intonation appears to be very well suited to blues. Another point of discussion is the “blue notes” and the “rub” factor of these notes. A pure, in tune Harmonic 7th Chord is extremely stable, so that adding a “blue” note on top can provide a very clear, audible, and meaningful rub. In fact, against a stable JI chord, these notes have the potential to have more impact than they would against a chord that is constantly “rubbing” against itself. Multi-equal temperament tunings, such as 31-tone temperament, can provide excellent 7th chords and many new blue notes. The tang of a sharp 4th in 19-tone equal can be very bluesy. In fact, ANY tuning system can be good for blues, with the right musician.